The Better Chip Offers A Healthy Snack Alternative To Satisfy You. Fresh Spinach And Kale Combine With Corn Masa To Create A Better-Tasting, Better-Dipping Chip That'S Naturally Gluten-Free. Made With Only 100 Percent Natural Ingredients, These Thick, Hearty Chips Contain Nothing Genetically Modified And No Preservatives. These Vegan-Friendly Chips Are Simply Better For You And Made In A Completely Nut-Free Environment.. 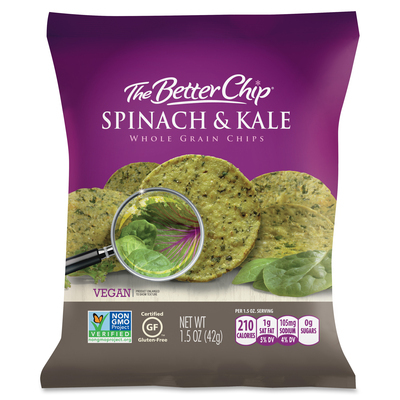 The Better Chip Offers A Healthy Snack Alternative To Satisfy You. Fresh Spinach And Kale Combine With Corn Masa To Create A Better-Tasting, Better-Dipping Chip That'S Naturally Gluten-Free. Made With Only 100 Percent Natural Ingredients, These Thick, Hearty Chips Contain Nothing Genetically Modified And No Preservatives. These Vegan-Friendly Chips Are Simply Better For You And Made In A Completely Nut-Free Environment.